1 In a small bowl mix together the soy sauce, sake, mirin, honey, ginger, chilli and spring onions to make the teriyaki sauce. Set aside. 2 Heat vegetable oil in a large pan and cook chicken breasts on medium high heat for 4-5 minutes until browned all over. Reduce to medium heat, add the onion, Knorr Garlic Stock Pot and Knorr Chicken Stock Pot and fry for a further 5-7 minutes, stirring regularly. When the chicken is almost cooked pour in the teriyaki sauce. Add the carrots and red peppers. 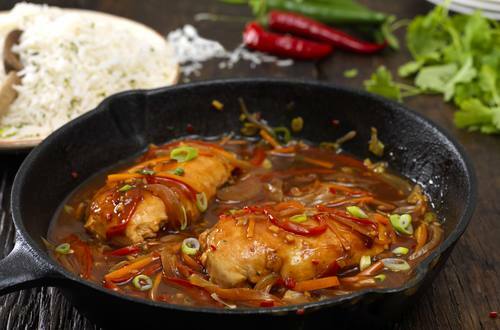 Use a spoon to keep pouring the sauce over the chicken and cook for a further 3-5 minutes until the chicken is cooked through and the sauce starts to thicken. 3 Add the sesame oil and cook for just 30 seconds. 4 Serve immediately with the cooked rice.